Senator Dianne Feinstein, Chair of the Senate Intelligence Committee, has introduced a bill designed to bolster some of the worst NSA surveillance programs and grant new authority to the NSA to engage in surveillance. Senator Feinstein is touting this proposal as a way to address the problems with uncontrolled NSA spying, but don’t be fooled: it’s a fake fix. The Fake Fix is already out of committee and the Senate could begin voting on it soon. Please act quickly to help us defeat this terrible bill. If you're outside the US, you can take action by telling companies to demand accountability and transparency. 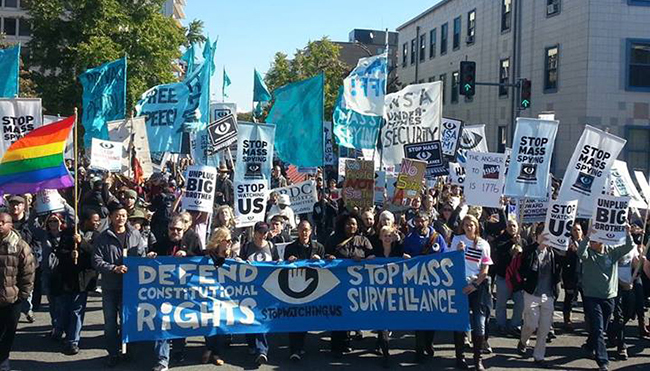 Last month thousands converged in Washington D.C. in a demonstration against the National Security Agency's mass surveillance. 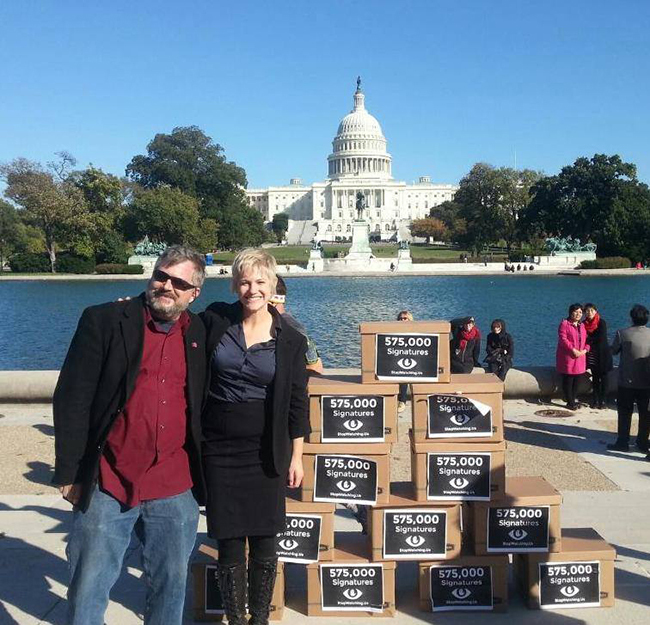 We delivered hundreds of thousands of signatures from concerned individuals to Congress. The New York Times' editorial board has written what amounts to an endorsement of the Trans-Pacific Partnership (TPP), even as the actual text of the agreement remains secret. That raises two distressing possibilities: either in an act of extraordinary subservience, the Times has endorsed an agreement that neither the public nor its editors have the ability to read. Or, in an act of extraordinary cowardice, it has obtained a copy of the secret text and hasn't yet fulfilled its duty to the public interest to publish it. Yet another one of the nine companies originally implicated in the PRISM program has released its first transparency report. Apple joins the ranks of Google, Yahoo, Facebook, and others that have issued reports that detail the number of requests the companies receive from governments for user data. A Washington Post article has revealed that the National Security Agency has been siphoning off data from the links between Yahoo and Google data centers, which include the fiber optic connections between company servers at various points around the world. This is not part of the PRISM collection or the business records program under Section 215 of the Patriot Act, but a separate program under what appears to be Executive Order 12333. Patent litigation is notoriously complicated and expensive, making it the perfect tool for patent trolls. Trolls use the costs of litigation as a threat to demand quick settlements. Even worse, they know how to ask for the right amount of money at the right time, and those demands are not part of the public record. That's why we led a large coalition this summer to launch Trolling Effects, a database of demand letters, open to the public. Another day, another silly trademark claim—but even silly claims can have real consequences for folks who don’t have the resources to fend them off. That’s why EFF today filed an amicus brief in the case of Fortres Grand v. Warner Brothers. This case involves a dispute over a fictional product—a software program called ‘Clean Slate’—that appeared in a Batman movie. Digital Citizen is a monthly Arabic/English bilingual review of news, policy, and research on human rights and technology in the Arab World. The Guardian, one of the papers behind many of the NSA reporting in recent months, has produced this interactive feature synthesizing what the revelations mean for you. Al Gore: NSA spying is "outrageous" and "unacceptable"
Speaking at an event in Canada, former Vice President Al Gore slammed the NSA programs revealed by Edward Snowden's leaks as "completely unacceptable." In San Francisco and cities around the world, people are gathering for hackathons to work on projects and causes to which Aaron Swartz, the late programmer and activist, dedicated his life. The San Francisco event begins at the Internet Archive on Friday evening and features speeches from EFF Legal Director Cindy Cohn and others, then moves to Noisebridge for two days of hacking. Some events, including San Francisco's, may require RSVPs. San Francisco, CA, and other cities. EFF and HeatSync Labs are teaming up in Mesa! Visit your friendly neighborhood hackerspace and discover the latest developments in advancing digital freedom. Hosts from EFF: International Director Danny O'Brien, Activist Trevor Timm, and Media Relations Coordinator Dave Maass. Techno-Activism Third Mondays (TA3M) are informal meetups that occur on the same date in many cities worldwide. It is designed to connect techno-activists and hacktivists who work on or with circumvention tools, and/or are interested in anti-censorship and anti-surveillance technology. At monthly Hacks and Hackers meetups, journalists and computer programmers get together to talk about how they can help each other out. This month, EFF Activist Parker Higgins will be speaking about the importance of encryption for working journalists and what tools are available.